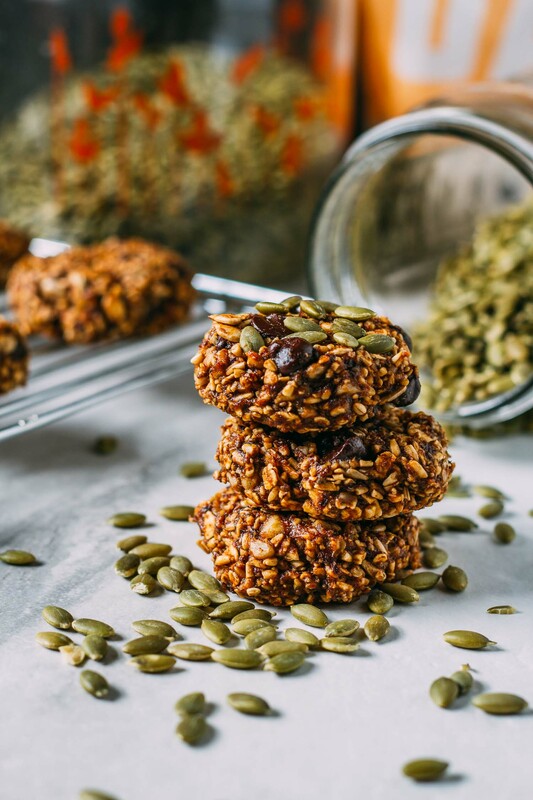 Pumpkin Power Breakfast Worthy Cookies are so healthy that you can call them breakfast or dessert! That’s one reason why we love these gluten-free rounds of cookie goodness so much! They’re nutritiously delicious and an ideal grab-and-go bite. What’s not to like about a more relaxed start to the day? These cookies are chewy, crunchy, a tad spicy and taste ever so lightly, well, sweet. They’re just sweet enough to call them a cookie rather than a biscuit. And some of that sweetness comes from the unexpected source of dried plums, aka prunes. And when you sweeten baked goods using whole fruit sources, your body utilizes the carbs from the sugar as energy more efficiently. 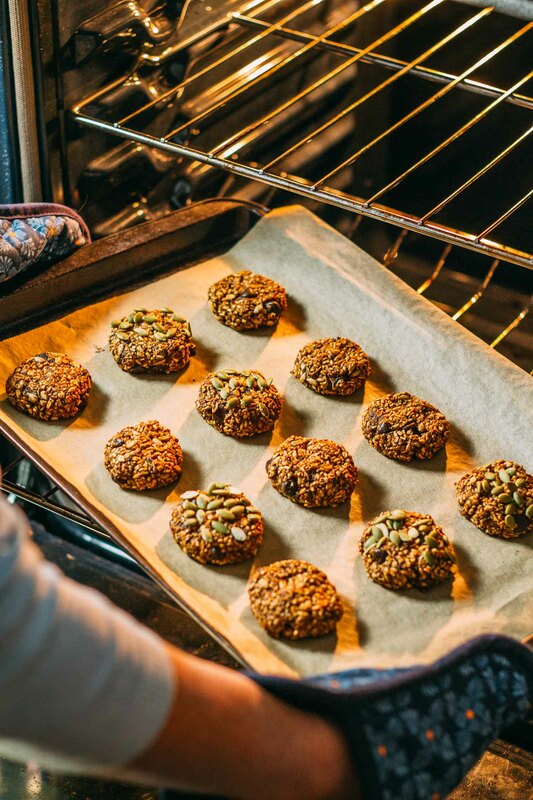 Whenever possible, we choose to sweeten using whole fruits when we bake because we do our best to avoid using refined sweeteners; our Pumpkin Power Breakfast Worthy Cookies are no exception. Refined sugar is calorie-dense with no nutritional value. It can show up in many different forms in the products we purchase at the grocery store. Sugar often serves as a preservative as well as to enhance the sweetness of certain products. And although most of us know we shouldn’t make a habit of eating refined sugar; when we do indulge in the occasional packaged food, it can be difficult to determine how much sugar we’re getting due to it having many different names. Sugar is commonly on the ingredient label as glucose, fructose, sucrose, maltose, lactose, dextrose, starch, corn syrup, fruit juice, raw sugar, and honey, or a sneaky combination of them. Pumpkin puree provides the natural cancer fighters alpha and beta-carotene. Flaxseed provides a boatload of heart-protecting omega-3s. It also has hundreds of more lignans (compounds that may prevent endometrial and ovarian cancer) than any other food! To learn a bit more about flax and chia watch this clip by Dr. Greger of NutritionFacts. Oats digest slowly keeping you full for a more extended amount of time. Chia seeds have a ton of soluble fiber, even more than flax, which is known for lowering cholesterol. Dried plums (prunes) offer polyphenols — plant chemicals that have been shown to boost bone density by stimulating your bone-building cells. Walnuts provide an omega-3 fat shown to improve memory and coordination. Now, all we need to mention is a quick word about how easy these are to prepare! They’re ridiculously easy! 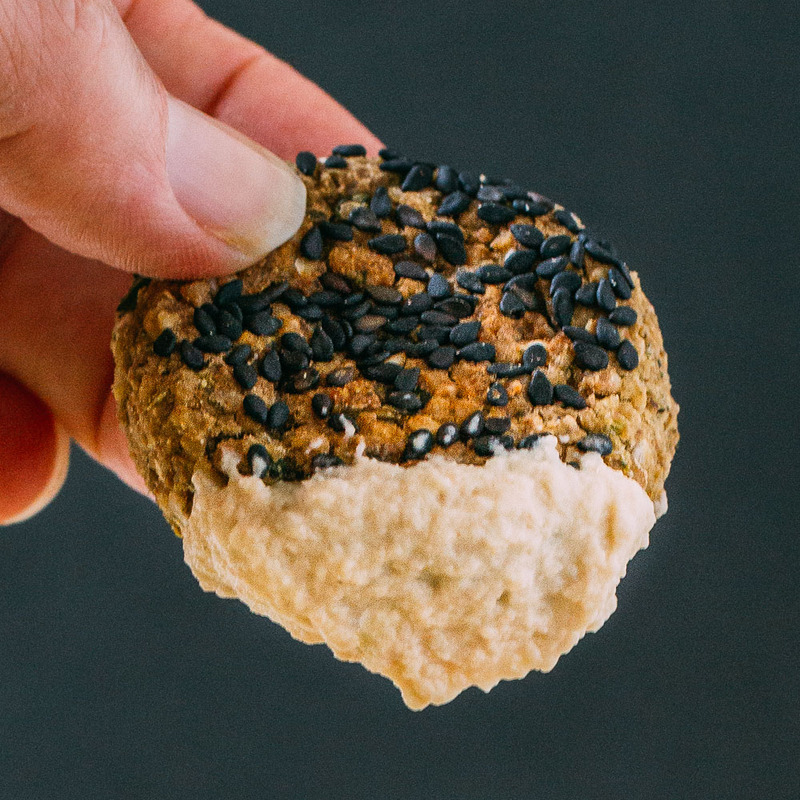 They make the perfect plant-based snack or full-on breakfast. And also, let’s not forget that they taste terrific with a refreshing glass of our quick and easy homemade Creamy Cardamom Banana Milk. 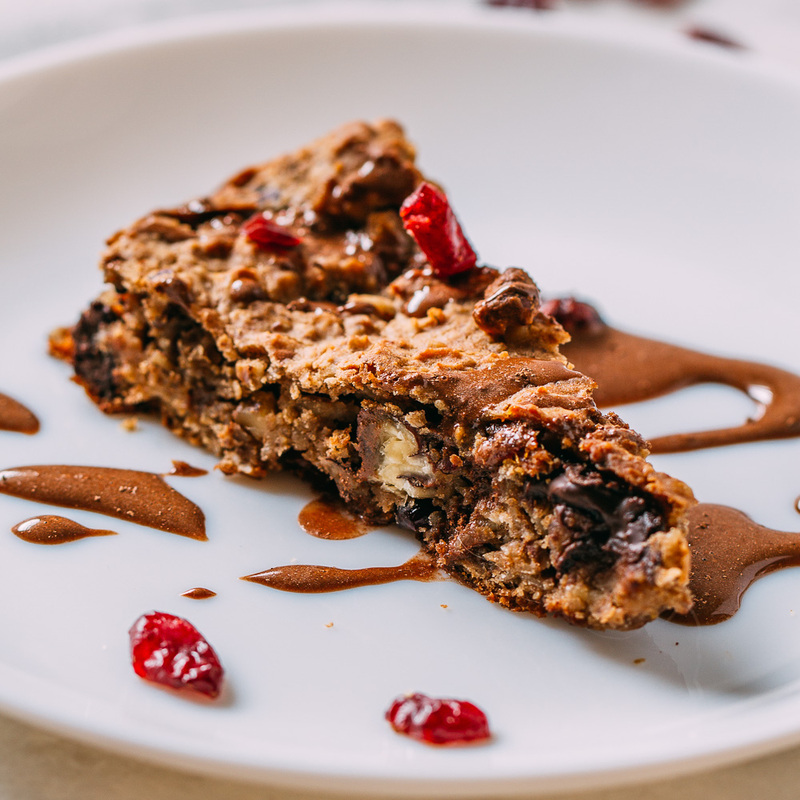 And when you find that you enjoy Pumpkin Power Breakfast Worthy Cookies as much as we suggest, be sure to try some of our other tasty vegan and gluten-free recipes. 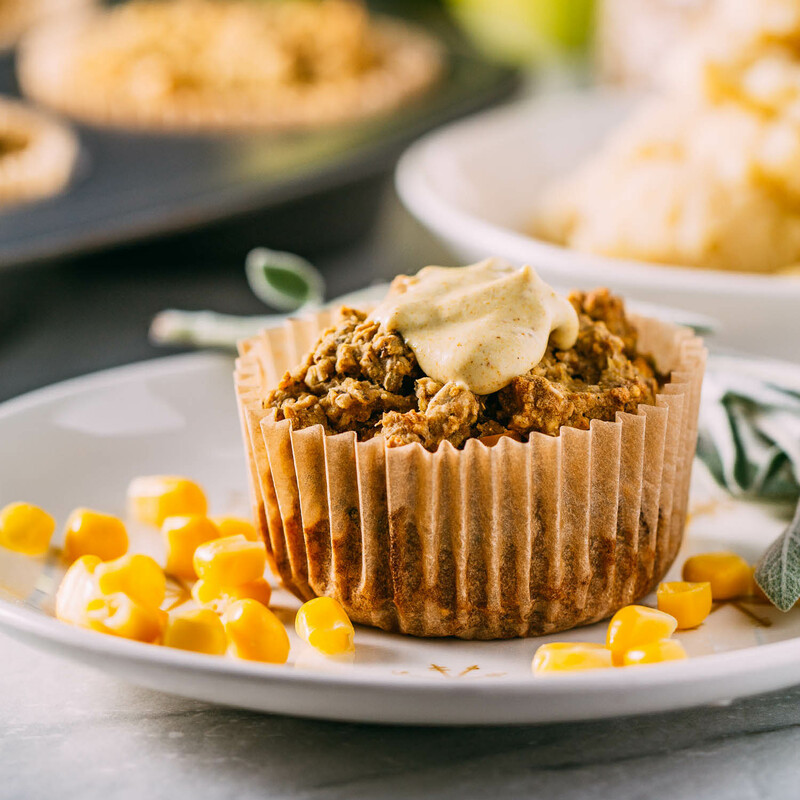 Two other busy morning fan favorite recipes are our Banana Oatmeal Chocolate Chip Muffins and our fast Chocolate Elvis Smoothie. We would never have imagined recommending cookies for breakfast, but these Pumpkin Power Breakfast Worthy Cookies live up to their name and then some! 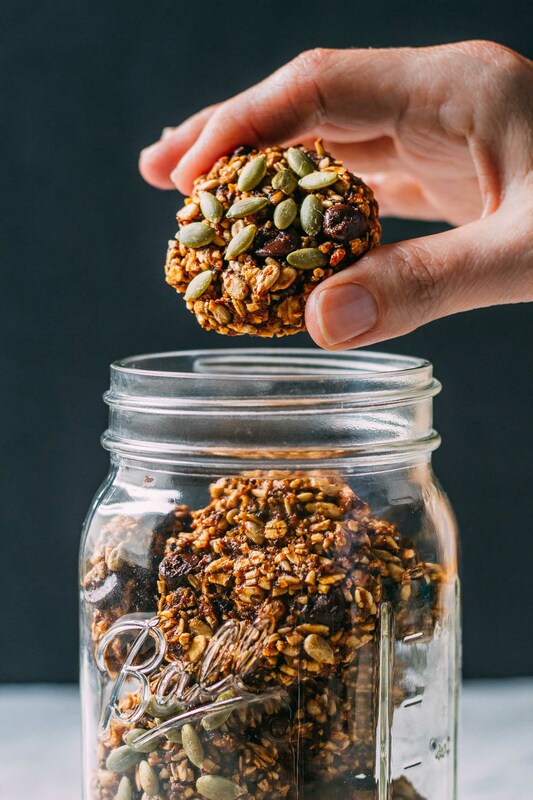 Filled with all sorts of wholesome, nutritional ingredients like oats, prunes, walnuts, chia, pumpkin, and banana, they’re a refined sugar-free, gluten-free and oil-free plant-based vegan treat that’s hard to beat! This recipe will make about 18 cookies, depending on the size of your prebaking scoops. These cookies taste terrific with a quick and refreshing glass of homemade Creamy Cardamom Banana Milk. 1/3 cup of pumpkin puree - We love this organic brand of pumpkin puree. 1 tbsp of apple cider vinegar - We like this brand the best! 1/2 cup of old-fashioned rolled oats to grind with the chia - Make sure you use gluten-free oats if gluten is of concern. 1/4 to 1/2 cup of raw walnuts, finely chopped - We often order this brand of organic nuts one full pound at a time. an optional but delightful 1/3 cup of plant-based vegan dark chocolate chips or cacao nibs - In the cookies pictured we used the "Enjoy Life" brand of vegan chocolate chips. Begin by preheating your over to 350º Farenheight and lining a baking sheet with parchment paper. In a medium-size mixing bowl combine and set aside the first six ingredients which include the ripe banana, mashed, pure maple syrup, raw pumpkin puree, plant-based milk, the ground flaxseed, and the apple cider vinegar. In a food processor combine the chia seeds and the half cup of old-fashioned oats, blending until the oats turn into flour. Next, in a large mixing bowl, combine the whole old-fashioned rolled oats, baking powder, baking soda, cinnamon, and salt as well as the oat flour chia mix you just created. Stir so that the dry ingredients are distributed evenly and set aside. Now chop the prunes/dried plums or other dried fruit of choice into small bite-size pieces and add to the bowl of dry ingredients along with the sunflower seeds, chopped walnuts, and vegan chocolate chips if using. Stir in the wet ingredients just until everything is combined well - there's no need to overwork the batter. Note that we used 1/2 cup of sunflower seeds in the cookies and then an additional 1/4 cup of pumpkin seeds were pressed on top of some of the cookies. Drop the batter by rounded teaspoons full onto the prepared baking sheet and bake for about 12 to 15 minutes. Before baking, if you like, press a few seeds on top to decorate the cookies to add some extra crunch. After cooling completely, store in a covered container for a couple of days on the counter or refrigerate. Pumpkin Power Breakfast Worthy Cookies can also be made ahead since they freeze well. This recipe will make about 18 cookies, depending on the size of your scoops. Instead of dried plums, you could opt to use dried cherries, cranberries or any variety of raisin. 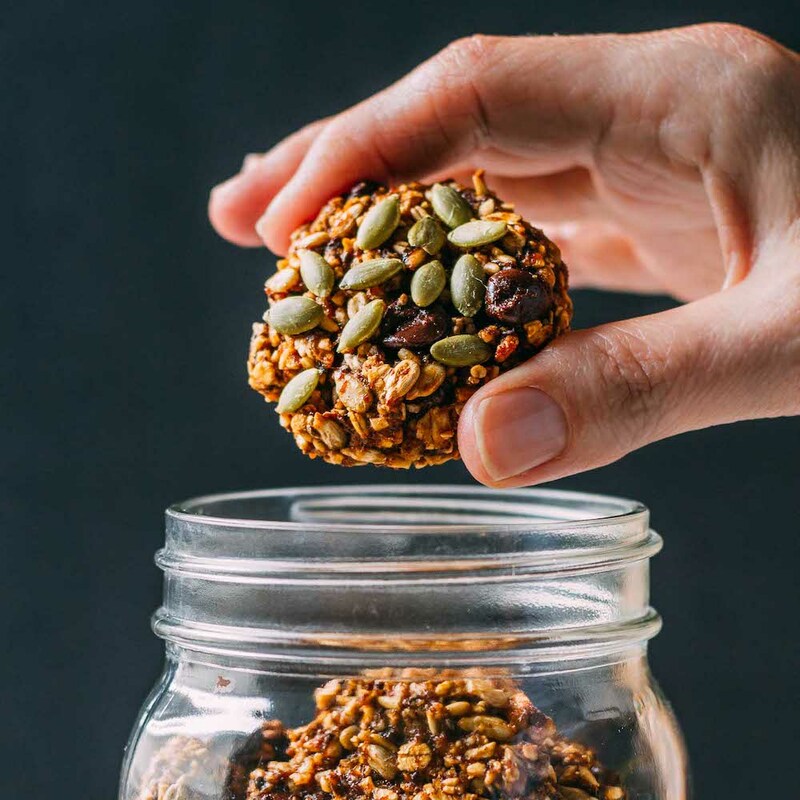 To make Pumpkin Power Breakfast Worthy Cookies nut free, sub in some additional raw seeds of your choosing or leave out the walnuts. If you find yourself using cacao nibs often or enjoy a terrific deal, we found that this brand offers two pounds at a competitive price.